AudioQuest - GO4 Speaker Cable - 10 ft. pr. Using the same solid-core SST geometry as the AQ Type-4, the GO4 sonic improvement is a result of the PSC (Perfect Surface Copper) used in its manufacturing. 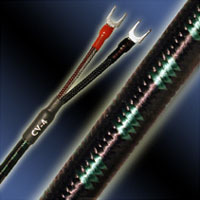 This unique metal allows the GO4 to out-perform previous AudioQuest cables that cost several times as much. The level of focus, transparency and detail are unprecedented at this price. The AQ GO4 can be ordered in any length. Call for more information.